Thomas and I met as Juniors in High School. We had known of each other because we were from the same small town in Arizona but had never officially met. I always thought of him as the handsome guy on Swim Team with the dreamy blue eyes and as it turned out, he would always point me out to his friends during my Dance Team performances as the girl he wanted to date. He finally “introduced” himself over the popular social media of the time, Myspace, and not soon after, in person at our school. We went on our first date to ice cream and later that week he asked me on what he called a “real” date to dinner and a movie. Unknown to him, he had mistakenly texted me instead of his best friend asking whether to ask me to be his girlfriend or just his date to Prom(which was 3 months later). He ended up asking me to Prom and we shared our first kiss that night, where we both swear up and down, that the whole night sky lit up for us during that moment. I came home floating on cloud nine and proceeded to gush over the details to my parents while eating an entire bag of Taco flavored Doritos. He ended up asking me to be his girlfriend a few months later on April 24, 2009 and we were inseparable through the end of High School and into College as best friends and boyfriend/girlfriend. 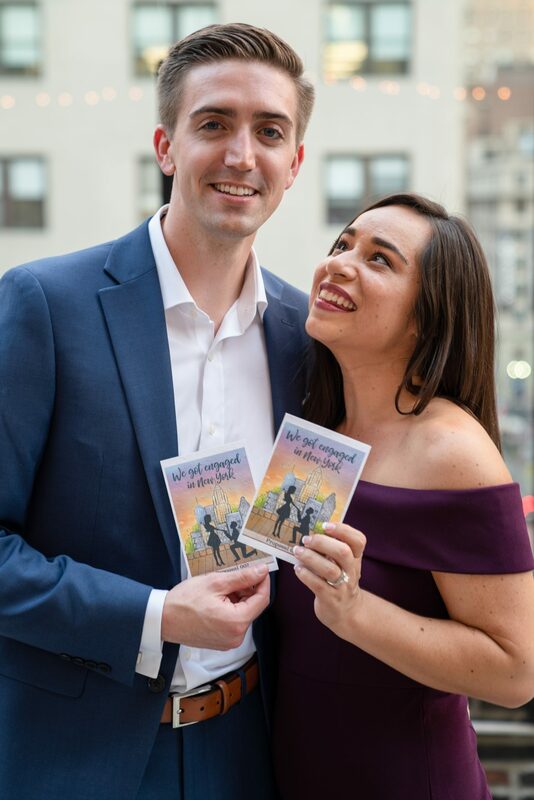 Our twenties proved to be a challenging time where we both didn’t know what we wanted to do or who we wanted to be, so after six years of dating, we broken-heartedly parted ways. We spent the next two years apart, where we both dated other people and grew as individuals, until we were reunited by his best friend who invited me to join in a group hiking trip to Havasupai. It was something he and I had dreamed about doing, so I accepted hoping that we would be able to be friends again. He texted me a few days later about the trip and asked me to meet up at a Lantern Festival later that week(which I didn’t realize was a date) and we both filled each other in on the past two years of each others lives. We continued to hang out as “friends” for months, while my friends and family excitedly kept asking when we would be getting back together. I assured everyone we were just friends because that’s what I thought we both wanted – diving back into our love story felt like too scary a jump; I was just so happy to have him back in my every day. He invited me to a Christmas movie marathon at his place to celebrate him buying a new couch. We proceeded to watch three Christmas movies on opposite ends of the couch and drink his fancy Irish Whiskey. After refilling our glasses, he sat back on the couch – this time next to me. Fueled with liquid courage, he put his arm around me and moments later he kissed me. As soon as his lips were on mine, I felt like I was home. We looked at each other and through tears, we both expressed how much we loved each other and how we hadn’t ever stopped. From that moment on, we raised his puppy together and slowly navigated “adult” life together. Every day showed us how we were each other’s missing puzzle pieces and that we were meant to be together, everything made sense and our hearts felt complete again. Our renewed appreciation for each other and the love that we shared helped us create a strong, healthy relationship foundation with a mutual desire to create a future together. Fast forward to 2018, I landed a new job at the same company as Thomas. After I finished training, we were excitedly ready to cash in some PTO to turn our Labor Day Weekend into 5 days off. We knew we wanted to go somewhere, we just weren’t sure where. We started looking at places to go and with only three weeks to plan, we were leaning towards the Pacific Northwest. Last minute, I found an amazing deal on flights and a place to stay in New York and when I told him, without hesitation, he told me to book them. Since Junior Prom, I’ve known that this was the girl I wanted to marry. She’s my best friend and the most important person in my life. Without Alex in my life, I know I would have become a completely different person. She makes me a better man. 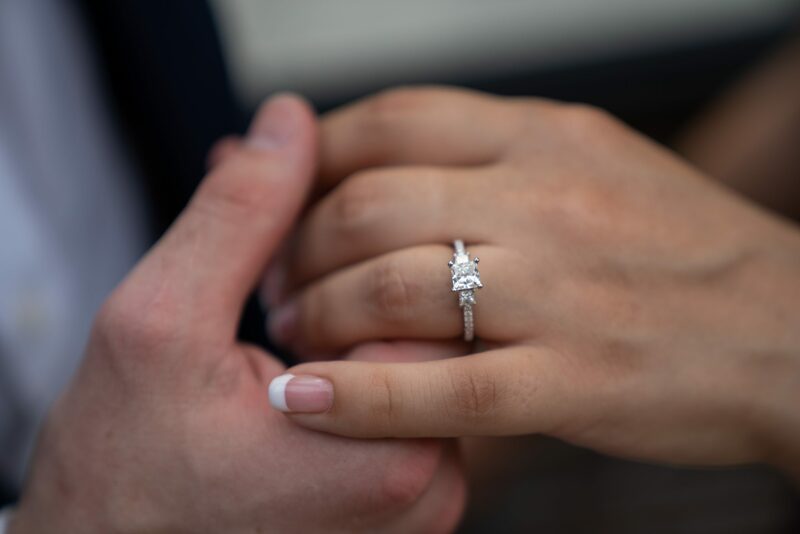 There was no question in my mind that no matter how I asked her to marry me, she would say yes but I wanted to ask her in a way that she deserved. The challenge was figuring out how to propose and completely take her breath away. 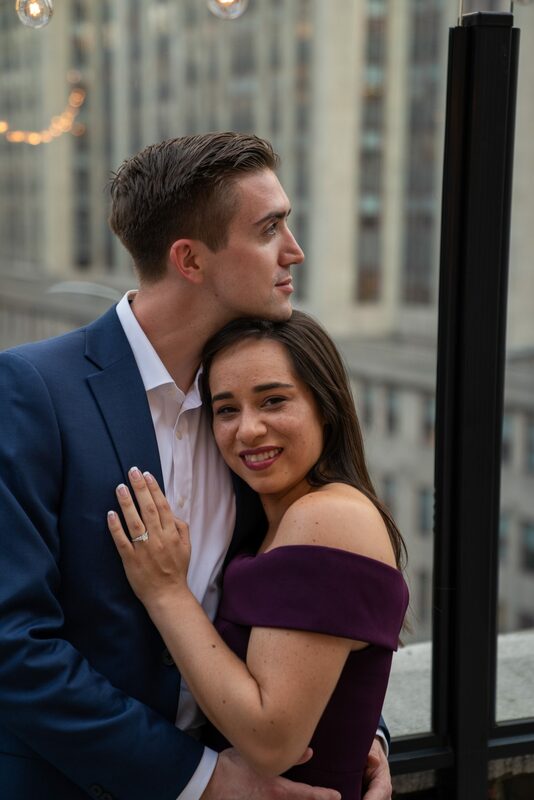 Earlier in the year, I had told my buddy that I always imagined proposing to her in New York City but I had no idea how I could make that a reality while also saving for buying a home together. I had been planning to propose sometime during the Fall of this year, so when we decided to make a long weekend even longer over Labor Day, I knew this was my chance. We were originally planning to go to Portland, so I was researching everywhere I could make a perfect moment. I knew I wanted it to be something she would remember forever and something that our kids would grow up knowing the story of. As soon as she told me about the deal to New York, I knew it was a sign. like her. 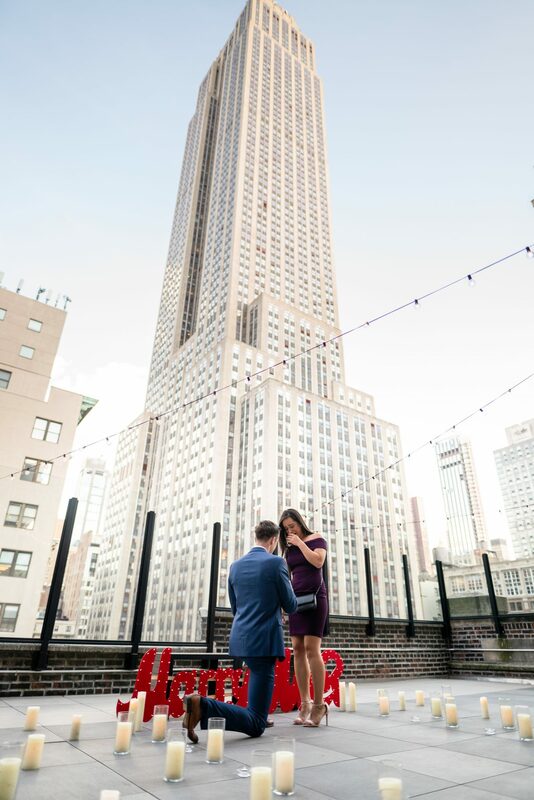 Then I researched and hired a New York photographer and event planner to help me put together the romantic rooftop proposal I had in mind. I told Alex that we needed to dress up for a “rooftop bar” in Manhattan during our trip but was vague on any details beyond that. She didn’t question the lack of information I was giving her because (according to her) I’m notoriously bad at remembering names/dates unless they’re written down in my calendar. We arrived in New York on Sunday, two days before I had planned to propose, and spent those days exploring parts of Brooklyn and Manhattan. I watched as she kept thinking the best parts of the trip were happening when I knew the best was yet to come. The night we planned for the rooftop bar, we mistakenly took an Express train, so we got there about 20 minutes early. I told her that because it was a nice place and we already had a reservation, we shouldn’t check in too early so we went into a nearby store to escape the NYC humidity and enjoy the AC for a little bit. When enough time had passed, we walked across the street and walked into the building. We checked in with security and rode the elevator up to a business suite where I tried to smoothly tell the receptionist we were there for our table. He paused a second too long and I was sure she was catching on that we weren’t at a bar, but then he told us they were finishing clearing it and would walk us back in a moment. He started walking us back and I was so sure she knew something was going on. 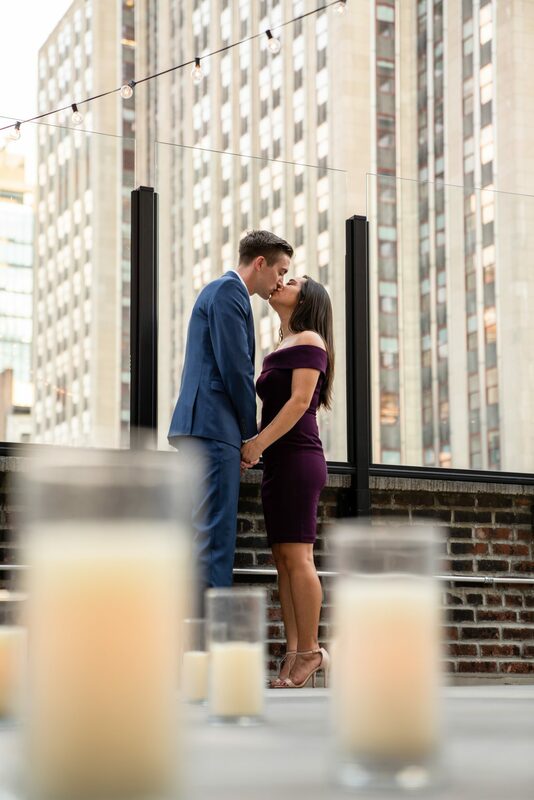 When we got to the door that led to the rooftop, the door started opening, exposing the candles on the ground and Empire State Building in the background, and I watched as she started to process that we weren’t at a bar and that a proposal – OUR proposal – was in progress. She looked at me with wide eyes and I nodded to let her know it was for her and tears immediately started to fall down her face. 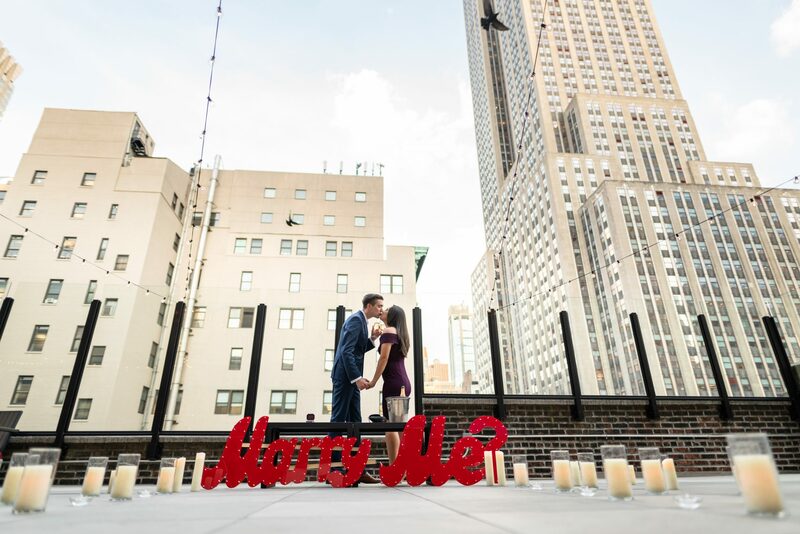 I walked her in front of the “Marry Me” sign and everything that I had been planning to say, I couldn’t remember. I got down on one knee and started to tell her how I had loved her since I was 16 and I asked her Dad for permission. I brought the ring out and asked her “Will you marry me?”. She said yes and I slipped the ring on her finger while I told her I had so much to fill her in on. 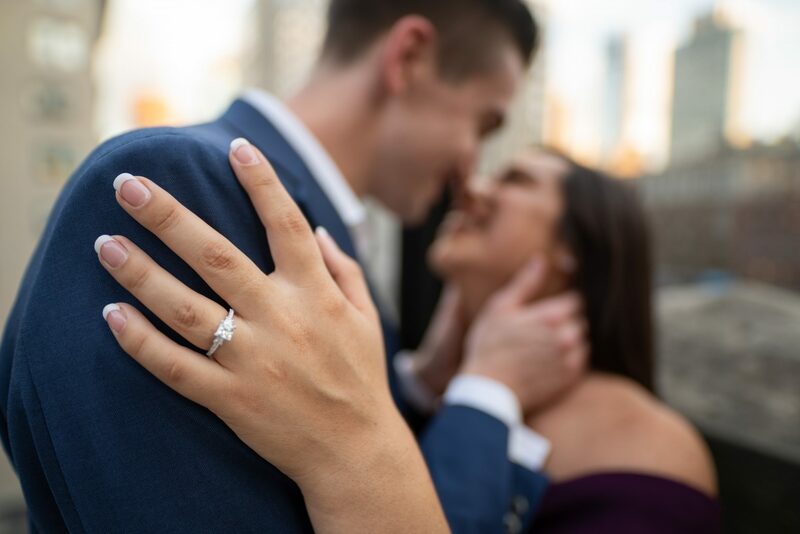 We shared the bottle of champagne that had been waiting for us and spent the next hour admiring each other/the ring, laughing and trading stories of all that I had been up to. When we were done with taking photos, I took her to get some authentic New York Pizza so that we could call our families with the exciting news. After dinner, we continued the celebration at a real rooftop bar with Manhattans in Manhattan to once again look over Empire State Building. We both agree, it was like something out of a movie and neither of us would believe it was real if we didn’t have the photos from our extremely talented photographer. We are so excited to be in this new chapter together and cannot wait to spend the rest of forever by each other’s side as husband and wife.